I have been associated to the field of online advertising for some time now. Still, mobile advertising is a new space even for me. The outburst that we call the mobile revolution gave people little time to adapt to the new format. In fact, as of now the pattern has been just the same as PC advertisements with a few adjustments. Ability to pay without putting credit card information every time (Google Wallet). Recently, LG used another innovative method of advertising on the smartphones. Instead of creating a single ad for the masses it created customized ads that would show up differently for different smartphones. The ad is for its LG G2 which is the latest flagship from the company. 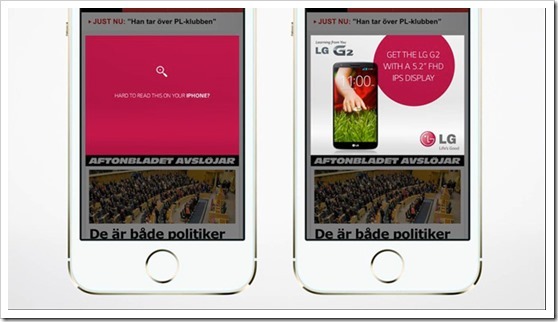 If the phone is iPhone 5S, the ad that is visible remarks at the small screen of iPhone 5S by saying that G2 has a large 5.2” screen. Similarly, for HTC One, the point of concern is its battery life. LG touts the battery life of G2. 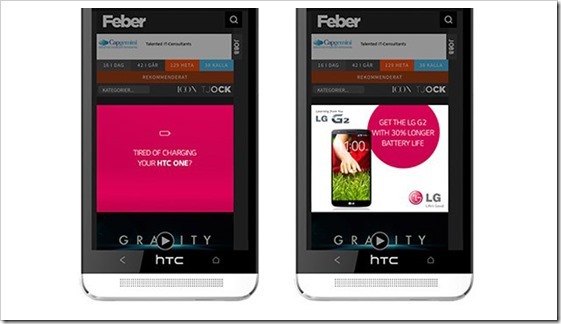 The ad says- “Tired of charging your HTC One?” and then- “Get the LG G2 with longer battery life”. 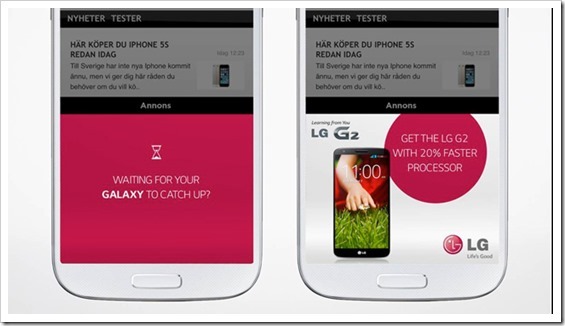 For Galaxy S4, the company simply states that G2 has a better processor. All the ads take a jibe at the current high end phones. They are created by PR agency M&M Saatchi and are running in Scandinavian countries as of now. While this may not make G2 the best phone of the lot, but it is interesting to see how the company is aggressively targeting users of the other high end phones directly. However, anyone who has just bought any of the other high end smartphone won’t be likely to switch anytime soon. Perhaps LG should target last year’s high end phone users like users owning iPhone 5 or Galaxy S3. LG is the third largest smartphone maker in the world and looking at this, they are probably not contending with that title.